Exclusive Notecards are also available- click here for details! 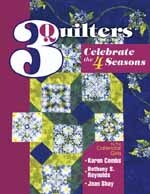 Celebrate the special qualities of each season in quilts! Three top quilt designers and teachers bring you projects for every month. As you journey through the calendar, you'll learn techniques and tips you can use all year. 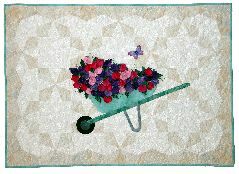 SPRING IS IN THE AIR designed and appliquéd by Joan Shay, with pieced background by Bethany Reynolds. Machine quilted by Judy Irish. Joan's wheelbarrow filled with Sweet Peas captures the promise of Spring. She asked Bethany to design a pieced background to compliment the appliqué. The butterfly just happened by. NOSEGAYS FOR MOTHER designed, pieced, and machine quilted by Bethany Reynolds. Bethany used Joan's Appli-bond technique to add interest to the throw, creating three-dimensional sleeves to hold the Stack-n-Whack bouquets. Bethany Reynolds presents fun new Stack-n-Whack® designs. 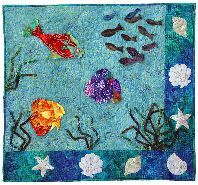 Joan Shay's designs feature her easy Appli-bond method for creating not only flowers, but birds and fish too. BY THE SEA designed and appliquéd by Joan Shay. Machine quilted by Judy Irish. The sea is an integral part of Joan's life on Cape Cod, so it's no surprise she was inspired to make some Appli-bond fish! The seaweed is easy-you can twist it however you want, and with a few stitches to secure it, it sways with the tides. 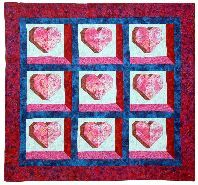 SWEET HEARTS QUILT designed by Karen Combs and Bethany Reynolds. Machine pieced by Karen Combs. Machine quilted by Judy Irish. Karen's original heart design has the illusion of depth. She asked Bethany to add a Stack-n-Whack twist to the design. Bethany used the Magic Mirror-Image Trick to create a very special design. 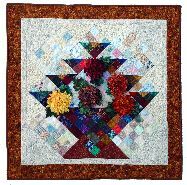 And Karen Combs adds her special touch with "Quilts of Illusion" to delight your senses. These three friends have also combined their talents on some projects to create unique new designs. THANKSGIVING BASKET designed and pieced by Karen Combs. 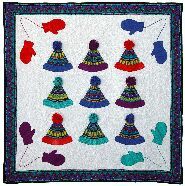 Appli-Bond mums created and appliquéd by Joan Shay. Quilt machine quilted by Judy Irish. Karen's original design is based on her Combing Through Your Scraps technique. Karen asked Joan to work her magic with Appli-bond. Joan filled the basket with mums to create a very special wallhanging. BUNDLE UP designed, pieced, and machine quilted by Bethany Reynolds. These ski caps and mittens recall snowy childhood winters. The Stack-n-Whack cutting technique ensures that everyone gets a unique cap! Joan taught Bethany how to make the cute pom-poms. 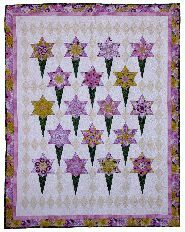 From enchanting appliqué to dazzling patchwork, the great variety of projects offered will bring quilting excitement all year!